Early 2019 will see the introduction of ‘Treseren’, a magical ‘homestead under the stars’ in beautiful Cornwall. A place to celebrate living, a place for family and friends, the making of memories and sharing good times. Set just 10 minutes from the spectacular North Cornish coast, Treseren sits in a secluded location in the midst of Trewithen countryside. Encircled by mature trees with two acres of secret gardens, winding pathways and wide lawns, the estate offers plenty of spaces for relaxation and play. 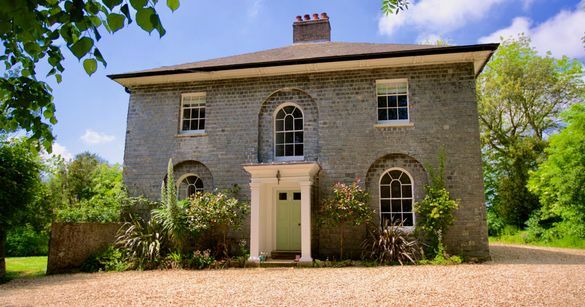 At the heart is Shepherds House; a Georgian beauty with Austen-esque proportions. The former residence of a Mine Captain, the house encompasses a plethora of historical and architectural features. Following a period of sensitive renovation and restoration by Paul and Emma Caddis of Elemental Interiors, the former owners of the Sunday Times Top 10 Hotel-listed, boutique B&B Treann House in Padstow, Treseren has already been used as a location in the fashion shoots of major brands. Launching as a self-catering destination for 2019, as well as the location for celebrations and small and intimate weddings, at Treseren, Georgian elegance meets contemporary cool. Against a muted palette of greys and whites, stunning period features are dressed with vintage pieces, Murano chandeliers and modern art, creating a wonderfully characterful, and deeply comfortable, space. A stylish retreat for discerning guests, the house offers luxury linens made for lie-ins, gardens filled with wild strawberries and raspberries and book shelves stocked with interesting reads for fireside reclining. From lazy summer days to magical winter stays, the best of Cornwall’s coast and country combine at the core of this special place. Treseren will be available from Easter 2019 for self-catering stays, celebrations and weddings with up to 20 guests. The house offers accommodation for up to 10 guests in five bedrooms with children being very welcome alongside up to two dogs. Issued by Excess Energy Communications. For further info, high res imagery, digital film clips or interviews with the owners, please contact Sarah Harrington or Rhona Gardiner on 01637 852130/07714 634945 or Sarah@excess-energy.co.uk or Rhona@excess-energy.co.uk. Thank you. Treseren will be available from Easter 2019 for self-catering stays, celebrations and small, intimate weddings. Weekly Stays: Arrivals on a Friday.